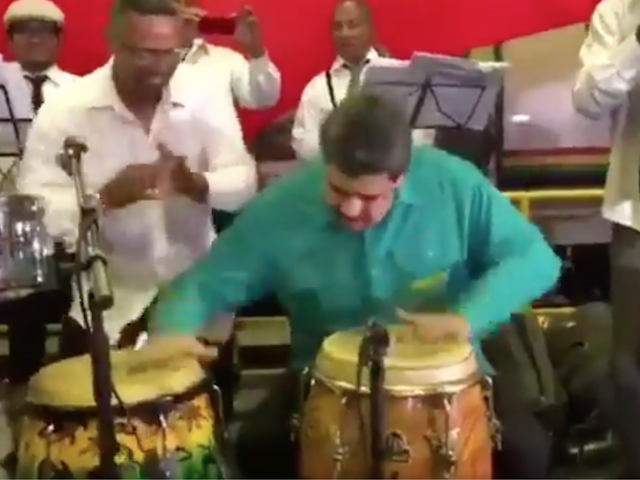 Venezuelan dictator Nicolás Maduro – close to marking three weeks out of power since President Juan Guaidó took office on January 23 – played a conga solo in a salsa performance this weekend that appeared in a state propaganda video circulating on social media. This was a far cry from the image of a diligent wartime leader he has attempted to cultivate to the outside world. Venezuela’s state television outlet VTV featured an initiative Saturday by the socialist government to organize tropical music concerts throughout the Venezuela-Colombian border, titled “We Are Brothers,” led by pro-regime musician Omar Enrique, whom VTV claims Colombia has banned from performing pro-Maduro propaganda songs in the country. Enrique, in his statement announcing the initiative, claimed that his “only sin is being friends with President Nicolás Maduro” and that he hopes to soon perform in Colombia. Regarding the concerts, Minister of Culture Ernesto Villegas accused Colombia of “fascism” for rejecting Enrique. Nicolás Maduro has for years attempted to use salsa music, a tropical dance genre native to the Caribbean region, to elevate his personal clout with the Venezuelan people. He is the host of a state-run radio program titled Salsa Time and has regularly appeared on television dancing or playing percussion with salsa bands. Last week, Maduro celebrated a government initiative on Twitter called “Salsa Heart,” the purpose of which was to use dancing and musical instrument classes to distract youth from protesting the nation’s near-complete lack of medicine and food. Maduro began this week with a much more aggressive push against the United States. On Sunday, he announced large-scale military exercises intended to protect against a U.S. invasion he has repeatedly claimed is soon to occur, citing the delivery of food and medical aid to the Venezuelan border with Colombia. While Maduro is no longer president of Venezuela, he retains the loyalty of the highest ranks of the nation’s military, who blocked the bridge connecting the two countries last week with boxcars and gasoline trailers to prevent much-needed American food deliveries from entering Venezuela. This week, Maduro announced the preparation of troops to deploy and attack the alleged American invaders hiding in shipments of food and medicine. Maduro declared that all of Venezuela was “impenetrable” to U.S. forces, thanks to the nation’s air force and army troops. Maduro’s troops will likely not face off with American soldiers, as the Trump administration has repeatedly emphasized that, while a last-resort military option is on the table, Washington has no intention of using military force to help bring aid to the Venezuelan people. The aid currently stuck in Colombia is part of a $20 million package of food and medicine sent in response to President Guaidó’s plea to neighboring Western Hemisphere countries to send humanitarian aid to the country, clashing with Maduro’s long-term refusal to accept that a humanitarian crisis exists in the country. While the aid remains in Colombia, Americans are helping distribute some of the food and medications to Venezuelan refugees who made it to the other side of the border.